Nowadays USB external thumb drive usage is so common that you may end up plugging and unplugging the device quite frequently within a short period of time. 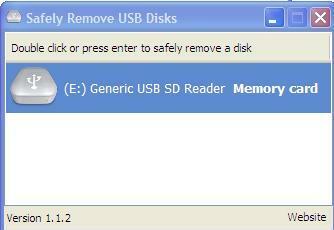 Instead of always double clicking on “Safely Remove Hardware” button at system tray to select a specific hardware device to stop before unplug or eject it, here is a tiny utility that allows a much more simple control by simply double clicking or just press the ‘enter’ button as a replacement of troublesome non-value added steps. Once download the utility and without the need to install, just unzip the .exe file and you are ready to go. Click on the utility will execute and launch it with a simple interface that is able to display all the removable drives that are plugged into your PC USB ports. And whenever you want to unplug the thumb drive or any external hard disk drive, just double click or simply highlight the selection followed by ‘Enter’ key press will release it to be removed safely. Good thing is, the utility can stay at system tray and it can be activated by clicking on the icon at anytime you need to use them. Consumed less than 500kB, USBDiskEjector is free for download and is compatible to use in Windows systems to simplify the thumb drive removal process especially when there is a need to frequently plugging and unplugging the drives for more effective work.